In January and early February I went on a textile trip to Laos. This is the continuing report on that trip from last month. For this report, I continue to discuss the textiles that we came across based on the areas that we visited. Last month I began with Phonsavan. Textiles in the Luang Prabang area. Luang Prabang, the northern capital of Laos is a hub for textiles. Local and more distant ethnic groups sell their wares here in markets, villages and galleries/shops. In addition both traditional cloth both new and old as well as more contemporary designs can be found. The Hmong are known for their wonderful batik textiles in combination with applique and embroidery. We braved a local village where we saw women and young girls stitching. These are very high powered saleswomen. Ock Pop Tok. 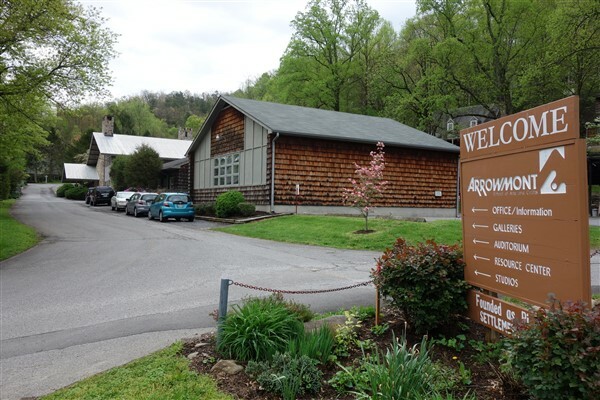 They have both a gallery and a “Living Crafts Centre”. Both display contemporary textiles. 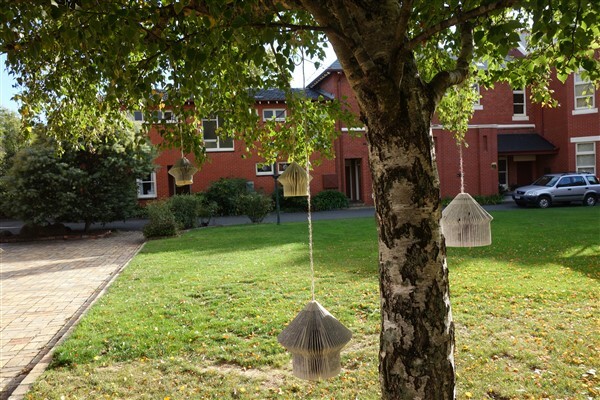 The Living Craft Centre also has information on textile production including silk production and natural dyes. There are also weavers and batik dyers producing product for the gallery. 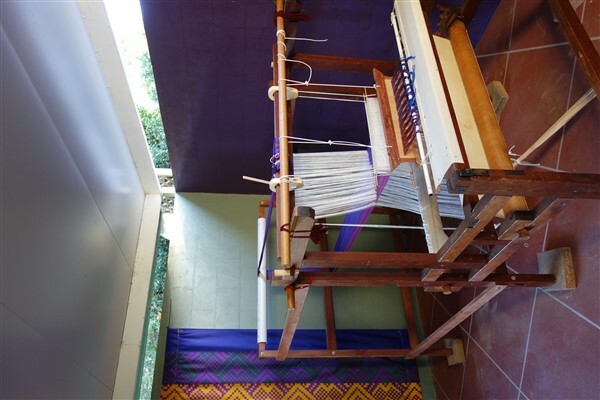 The following images show yarn and batik drying, and some contemporary weaving. Weavers use the long box loom with a vertical storage unit. String loops are used to store the patterns. The stored pattern is transferred to behind the shafts and put back on a sword to select the pattern for the supplementary weft designs. Many string loops can be used to store very complicated patterns. My pattern only used 40 loops. Several hundred loops can be used in a complicated pattern. One doesn’t need language to communicate with weaving. That’s my completed weaving hot off the loom. In addition to the pattern being used as a single supplementary weft it may also be used as a discontinuous supplementary weft for brocade. On my last trip to Laos and Thailand in 2015 I fully documented how these looms worked. There are several places that sell textiles. There are local markets of course but here are some shops/galleries/organisations that impressed me. Traditional Arts and Ethnology Museum have some great displays of various aspects of textile production and a shop selling textiles. Gallery Asiama is run by Linda Mackintosh and exhibits traditional cloth. As well as having many beautiful old textiles, there were a couple of “funery wraps”. These wraps are quite different to anything else I had seen from a weaving structure perspective either on this trip or the previous one. I was told that the technique is no longer being done and were produced in NE Laos and NW Vietnam. The technique is either two tie woven as “bricks” or three tie to achieve several colour areas. I saw both examples. The designs were large in scale. These were also found in another gallery exhibiting antique silverware and textiles where they were referred to as “banners”. Ma Teˊ Sai is run by an Australian who supports weaving in the villages and sells in her gallery. While the techniques are traditional her designs and applications are for the western taste. Caruso Lao is a gallery selling contemporary Lao textiles, wood carving and turning and silver smithing. In a village just outside of Pakse we saw mat mi or weft ikat being woven. They used a box loom with only 2 shafts for plain weave fabric. The vertical storage is not used here. An ethnic village has been set up outside of Pakse that is aimed at the tourists wishing for an overview of traditional crafts from the Atapu region. Each area was represented by a house with representatives from that area often demonstrating or selling their crafts. There were various warp faced textiles for sale which were woven on back strap looms. Some of these included that woven by the Katu. I loved the warp faced stripe combinations. A Katu village. The weavers here use beads on the weft. The yarn may be naturally dyed cotton however I also saw some commercially dyed in brighter colours. Sometimes synthetic yarn is also used. 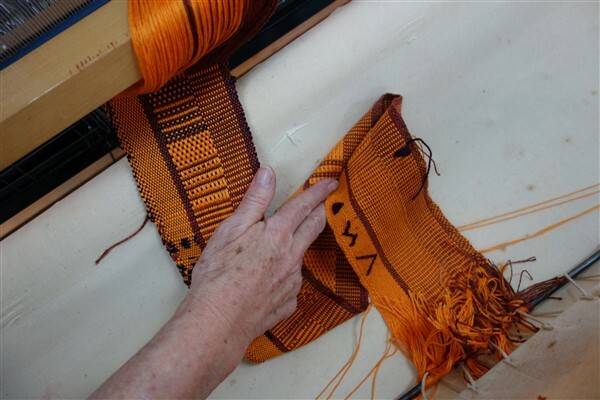 The process for weaving with beads on the weft. As well as many older women, I was delighted to see this young girl weaving with beads. While her design is simpler, the basic technique can be seen. The back strap loom is set up with as a combination of warp stripes to create an overall pattern and to enhance the pattern of the beads. There is only one weft thread. This has many beads threaded on it. The shuttle is to the left. When the beads are required they are counted off and woven in the approximate position. The weft is beaten. Then the beads are placed in the correct position according to the pattern before being beaten into place. Here’s a movie of the full process. The Dream Home supports women who were victims of human trafficking. Pakse Souveni had some exquisite mat mi. Textiles along the Mekong River south of Pakse. We saw no weaving being done. In fact there was very little weaving being worn. Life here revolves around farming and fishing. Of note we did see some fishing nets and baskets being made; all useful for this lifestyle. Laha Nam Village produces mat mi in natural dyes. We participated in a dyeing workshop here. The ethnic minority group of the Phu Tai originally came from northern Vietnam. They brought indigo and cotton weaving to the area many generations ago. Around 1975 weaving and dyeing stopped because of competition from Thailand. In 1989 -90 when Laos reopened after the war, a government company was set up to encourage people to work again. The company is no longer working with the villagers and instead they have been encouraged to form cooperatives to weave and sell their produce. Cotton is raised on the banks of the Mekong and processed in the village. There are several cooperatives in this village and over 200 weavers. The one we visited has 22 weavers. Details of the dyeing workshop will follow in another blog. 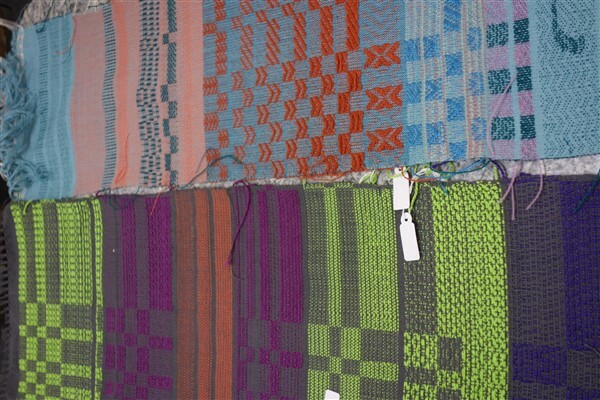 Here’s some examples weaving that was produced. We visited another mat mi village in this area. They were producing yardage of a standard size: 75 x 160cm. This was using commercially spun cotton/rayon on a synthetic warp. It was also typified by two weft rows of mat mi alternating with 2 rows of solid colour. The designs were quite contemporary. We bought in what appeared to be the communal shop where the weavers bought the yarn and then brought back finished product for sale probably to an established buyer. Carol Cassidy is a western entrepreneur working with the Laotian weavers to created contemporary designs based on tradition. I have visited Carol whenever I have been in Vientiane. As well as being the driving force behind the gallery and studio, she is also engaged as a consultant in Cambodia and Myanmar. She is very much aware of what is happening in textiles in Vientiane, nationally and in SE Asia. 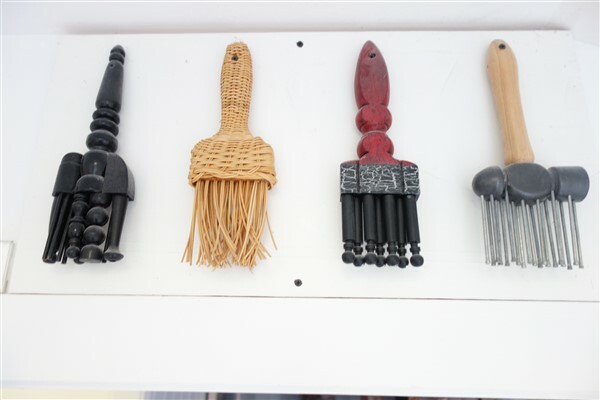 She employs several weavers on the gallery site. Nikone has a gallery and usually an attached workshop. Unfortunately the weaving workshop was closed due to flooding. She has also developed a range of textiles for sale in Europe and Japan. It is exciting to see that her daughter is becoming involved in the business and catering towards the Lao wedding market. This fabric woven with an ondule or fan reed was one of the treasures I found in the gallery. Phaeng Mai- gallery and weaving studio. There are some delightful contemporary woven fabrics in the gallery. It was great to return to Phaeng Mai where I had studied last year. Magic Lao Carpets is the first and only carpet making business in Laos. The carpets are hand knotted and are stunning. 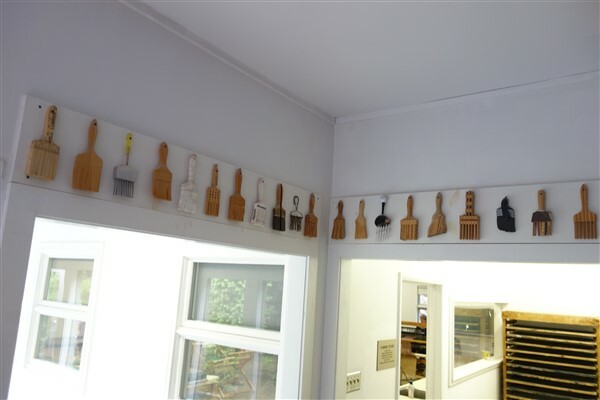 As well as seeing the finished product, we were able to see all the stages that go into weaving them. Each carpet is worked on by a team of young girls. They work from printed graphs. 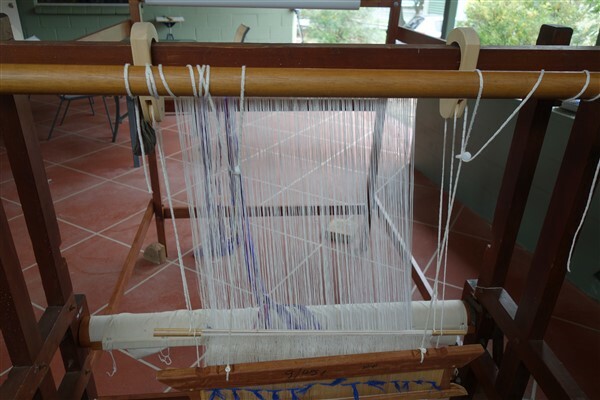 The silk is hand knotted around the warp. Note the line to check the pattern. Then they are beaten in. The pile is trimmed with shears regularly. There are several other galleries. Mulberries, which I had visited in Phonsavan, also has a gallery in Vientiane. Some interesting bits and pieces and overall impressions. This is how convenient a loom can be to set up. A weaver arrives with the warp all threaded through the heddles. 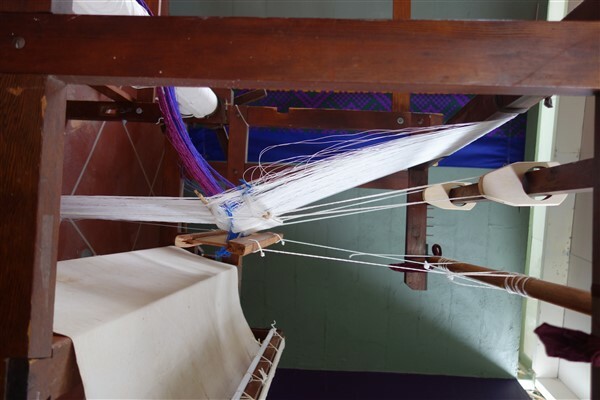 All that needs to be done to weave is to put it on the loom, attach treadles and suspend shafts. Often the very long warps (up to 90 m) for the supplementary weft weaving is loosely coiled in a bag and suspended from the back of the loom. In this case the warp has been wound on a board. This will result in even tension across the full width of this loom. 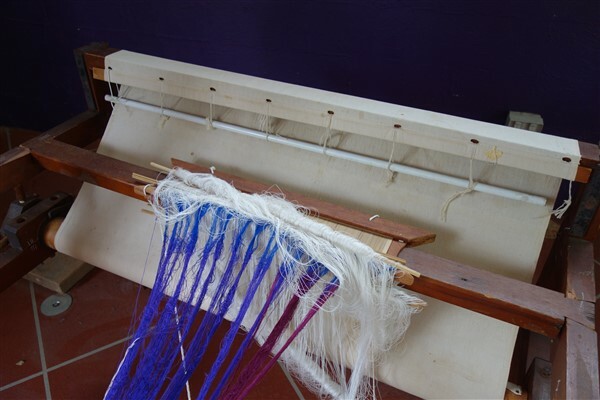 Note that this warp board is tied onto the loom and not permanently fixed. Bamboo stretchers are usually used. They are placed under the weaving, out of the way. You can tell on this weaving how frequently it has been moved. 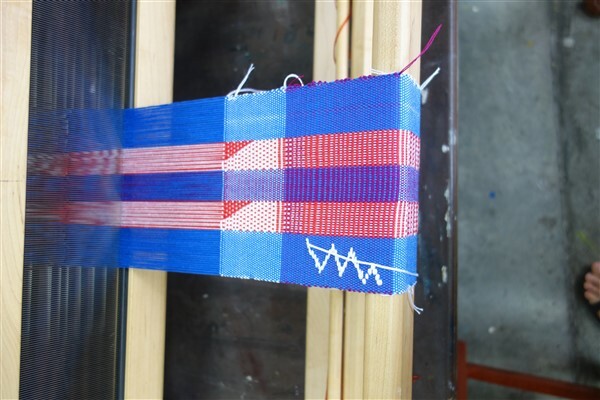 They are very useful when weaving weft ikat to keep the ikat consistently aligned. Textile production form a part of daily life. Looms are found under the houses. Here chickens roost on the loom with the most complicated mat mi. Many communities that are close to the Thai border have been impacted by the death of the Thai king. This is a year of morning. This has affected the sale of textiles for use in ceremonies including weddings. The village of Laha Nam has had a major downturn in indigo mat mi production. It has also resulted in an upturn in entertainment offered on the Laos side of the border with weekend tourism increasing. It is sometimes difficult to identify which ethnic group is producing which cloth. At one gallery we were told that it comes from “the north”. This may be because a middle man/woman is involved in buying the cloth or that they are directing villages into producing cloth of a particular style because it is popular and readily saleable. The issue of copyright is seen as a major one by many galleries. The best galleries aim at staying one step ahead of the competition. There are no laws that protect copyright. How prevalent is handwoven fabric in today’s society? In general daily life women are the only ones who wear traditional dress in the form of the sinh or skirt. Along one road, I surveyed how many women were wearing the sinh as opposed to western dress. In this instance it was about even. It does however depend on where one is. Remote villages are more likely to retain traditional cloth and certain ethnic groups seem to value it more than others. Areas where there are government or public jobs often require women to wear the sinh as a uniform. School uniforms require the sinh to be worn though it is a commercially woven version. I thought this market we stopped at along the road between Savannaket and Vientiane provided an insight. On one side of the aisle was a shop selling western clothes while directly opposite was one selling the sinh. The one area that still has high regard for traditional textiles and dress is the wedding industry. This will be the only time that men wear traditional dress. The cloth here exhibits a high standard of exclusiveness and workmanship. We heard that the generation of Laos and International women who had dedicated their lives to promoting weaving either traditional or contemporary were approaching retirement with a lack of young blood coming through. This must impact on the future of weaving and textile production in Laos. I saw these two panels in the Traditional Arts and Ethnology Museum. They reflect the diverse attitudes in ethnic minority groups as to the value of traditional textiles. 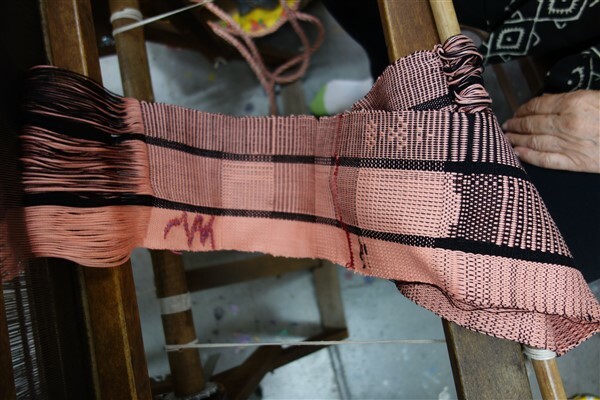 The government will play a vital role in the future of textiles. It was very evident that Laos is undergoing great development with financial partnerships with China, Thailand and Vietnam. This is creating new jobs which pay so much more than textile rates. The rate of growth was extremely evident in Vientiane with high rise buildings appearing and in the proliferation of petrol stations along major roads. The issue of the survival of traditional crafts in contemporary society is not new. As Laos moves into this new era of economic growth and the impact of the popularity of western dress increases, I hope that the knowledge and skills of those working with textiles will continue to be appreciated and for them to have a place for their work. 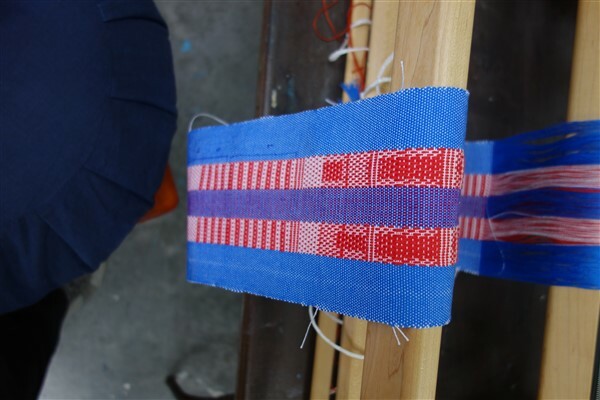 Coming: I will document the stages of mat mi, the indigo dyeing workshop we participated in and eventually a report on the textile experience in Cambodia. I am going to write 2 bogs for February. One will be on weaving in the studio (Part 2) while this will be the start of more to come. 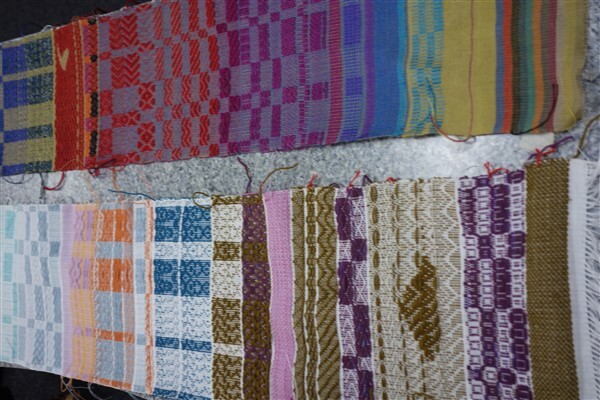 I have just returned from an amazing textile research trip to Laos and Cambodia. Some was self- directed but there was also an organised textile tour. Over the next few months, I will be assimilating and reporting on aspects of this trip. There is a lot to take in and I have barely unpacked, so only a very brief taster will be shared here. It will be the start of things to come. First up let me say that it has been just 2 years since I was in the north of Laos at Luang Prabang and 1 year since I was in Vientiane. There have been big changes connected with “progress”. One of note was the number of brand new fuel station along the roads. It felt like every kilometre there was one. Is this a sign of investment and even a raise in living standards? How has this impacted in particular on textiles? What has happened in the time that I was last here? These are some of the issues I will be considering later in addition to where I found textiles and the mechanics of various aspects of weaving. First a brief overview of where I went. I started off in Ponsovan, then drove to Luang Prabang. Trood Newman joined me on this leg. At Luang Prabang we joined the Textile Tour, organised in a fashion by Intentionally Different. The two experts who absolutely made this trip were Valerie Kirk who has been travelling here for many years and has a wealth of textile knowledge to share and Jit, our local tour guide. From Luang Prabang we flew to Pakse. Using Pakse as a base we explored the area working our way down to Kong Island at the most southern part of Laos. Driving north we passed through Savannakhet to Vientiane where the tour finished. From there Trood and another friend, Libby Hepburn, and I explored the area around Siem Reap. I am going to structure my report based on the areas that we visited before looking at in-depth aspects of weaving. Well that’s the plan. This area was heavily bombed in the Vietnam War and is often referred to as the “Secret War” as often the world didn’t recognise that Laos was a casualty in that conflict. Even now there are many unexploded ordinances (UXO). This has had the impact of much of the buildings needing to be rebuilt. Farming has been restricted because of the uncertainty when it comes to expanding farms and even digging in existing ones. There is a sense of ‘newness’ overlying tradition while at the same time progress being held in check because of the uxo’s and the community being kept poor. UNESCO is involved in clearing uxo. Land that was cleared needs to be re-cleared as more uxo become exposed. Tourism centres around the Plain of Jars. In a cultural sense, the actual jars are amazing. They are large stone jars. Why are they here? What were they used for? What significance in the development of culture did they have? They are awe inspiring. The shapes and forms and how they sit in the landscape are certainly a focus for contemplation. Even the fact that they survived the extensive bombing that happened in this area is a amazing. I was keen to visit Mulberries after my previous trip in 2015 where I came across the organisation in Luang Prabang. Mulberries was set up by Mrs Kommaly Chanthavong is a centre that focuses on the development of a sericulture industry. In 2015, I was aware that she developed this industry that involved the whole community and wanted to follow up on this project. Mrs Kommaly Chanthavong had because of her involvement in strengthening the position of women in the community been presented as an applicant for the Nobel Peace Prize. We drove to the centre on the outskirts of Xiengkhouang and met by a guide. This is the place where obviously the focus is on growing the mulberry trees and the raising of silk worms. We were shown all stages of silk production: reeling, skein winding, dyeing and weaving. It was disappointing that there were not many people working there when we visited. There were a couple of workers using skeining equipment while the dyers were off at a wedding and there were only 4 weavers at work. I wondered if some of the work that could be done off site (winding the silk from cocoon to skein, weaving and finishing) was being done off site and whether this centre apart from the silk worm/silk growing aspect was more of a collection/distribution centre. The weaving produced is sold in the gallery on site and in Vientiane. The retail outlet in Luang Prabang is now closed. In Vientiane, we visited the gallery and met with Mrs Kommaly Chanthavong. An interesting comment that she made was that the organisation was diversifying into soya production to support their community. I must admit that after the visit to the Centre, I felt that the strength of the textile production as to what I had remembered was not as great. More will be noted of Mulberries when we get to Vientiane. Mulberries grows 5 varieties of silk worms with several of these being cross breeds. Silk being reeled from cocoons. This equipment allows for many skeins to be prepared. One of the four weavers. 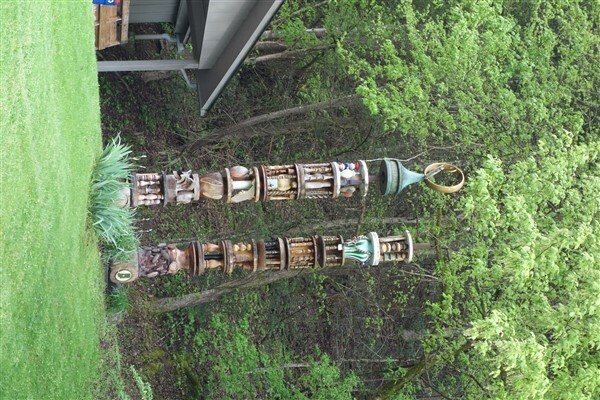 She is using a vertical storage system with sticks. There was a loom set up with string looms to store pattern but it had a few cobwebs and was obviously not currently being used. I understand that bamboo sticks are preferred though when the space becomes too cramped to use these, they move to the loops instead. All four weavers were using sticks. The weavers are from the Black Tai, Red Tai and Lao Phuan ethnic groups. A close up look at what is being woven. In this blog, I record the actual specific of weaving and things related from my recent textile tour to Bhutan. This blog follows on from my previous one. This store has some silk. The colours are brilliant though finding a shop that sells silk is much harder than the telecotton. Here both are on sale. The silk is kept in plastic. We saw cotton also being used for weaving though we didn’t actually try to buy some so I have no idea as to ease of access. Silk is of course the most highly prized yarn and is used for kushü. Here are spools of coloured silk for use for the supplementary weft pattern threads. I must admit that I acquired some lovely plied natural coloured silk- all that was left in a store 750g. I’m looking forward to using it. Wool. Yak hair is spun. The women will use a drop spindle to spin yak fibre. Here two spinners from different countries share a moment. We were also told that there are 3 types of wool: Australian is most preferred though it is expensive. Next best grade is wool from India and then lastly local wool. While many yarns are bought coloured, there is some natural dyeing being done. At Leki textiles we attended a half day dyeing workshop. We were told that in old silk textiles the following colours were used: white (natural silk), blue (indigo), red (stick lac), yellow (turmeric with buck wheat) and green (turmeric and buck wheat over indigo). This is the oldest textile in their collection. It is over 100 years old and came from the oldest sister of the first king. At the dye workshop we worked with 2 colours: red from stick lac, jatsho and yellow from turmeric. The following is what I observed and recorded. I have not confirmed details with any publications. I thought it was more important to write what was actually seen. The yarn was pre-mordanted by boiling with symplocos paniculata known as Asiatic sweet leaf. We were told that alternative “sour fruit” may be used. There was some discussion whether this meant quince. The yarn was set to one side while the lac was prepared. The lac was put in an aluminium buck and warm water added. It was worked vigorously. The water temperature was gradually increased to hot. It was repeated as many times as possible till there was no remaining colour in the lac. As the lac got hotter it clumped together, ending up as a solid brown mass that could be formed into flat hard cakes. This residue was used for sealing wax. The dyer must work more quickly, the hotter the water became. The liquid was strained and then boiled. Before being put in the lac, the pre-mordanted yarn was rinsed. Some “sour fruit” (quince?) was added to the boiling lac. Put the turmeric in the water and boil. This is buck wheat (sour variety) that is milled into flour and then blended with a small amount of water. Once the turmeric is boiling, the buck wheat slurry is added and brought to the boil. The fabrics and yarn are added and boiled. In all cases, the fabric is allowed to cool down before rinsing. I undertand that best results are obtained when the dyed material is left a while and allowed to dry before being rinsed e.g. for a week. This is the most basic of procedure that we saw and is for winding a basic plain weave fabric and was demonstrated at Leki Textiles. Required: two end posts and two vertical posts in the middle. The warp length is determined by the distance around the two outside posts. Noe that they are firmly weighted by heavy rocks to prevent movement. The two posts in the middle create the two sheds. The larger central post is used to create heddles. 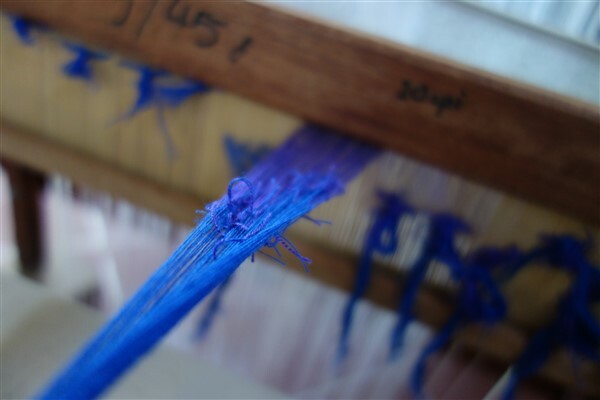 One thread (blue) goes through a heddle formed by the white thread. The other smaller post has the green thread looped in a half hitch. It is quite a skill winding a warp ergonomically. Please ignore the sound on the following movie. It has nothing to do with what you are seeing. This movie shows a friend, Bettes managing both warp threads. 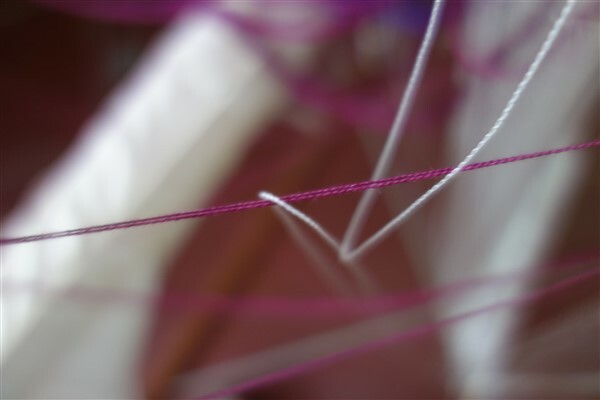 The more complex the type of fabric, the more involved is the winding of the warp. We saw two different methods for winding a warp that included a supplementary warp. Both methods required an extra two sticks. They will be used for both sheds for the supplementary warp. Method 1. This method was the one that we felt was the most difficult. The warp was wound back and forth. The basic principle for the ground is the same. 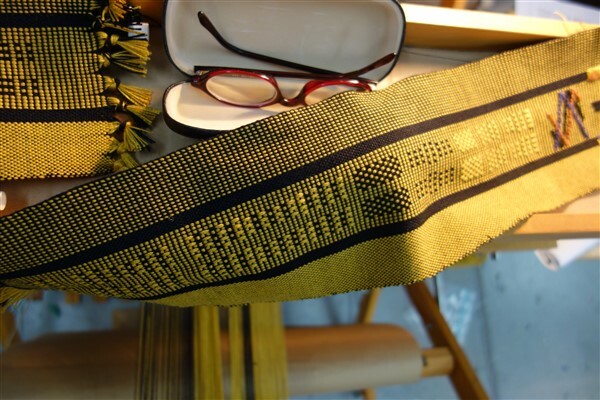 The two yellow threads are the ground and are used alternatively for the heddle and other ‘shaft’ stick, as before. The red thread is the supplementary thread and passes alternatively around the extra sticks. It is quite lovely listening to the mother and daughter talk while she winds the warp. This method achieves 2 ground warp to 1 pattern warp in this case. This was the cloth that she wound the warp for. She used it to check her warping sequence. Method 2. The warp was wound in a continuous circle. This is the start of the plain weave outside stripe. The supplementary thread has yet to be started. The winding of the warp has been finished. It was too dark the previous night to record the addition of the supplementary thread. The supplementary thread as per the previous video has been wound around the two extra posts. The difference is that there has been no change in direction. This method seemed more logical for me. I have used my sample that this warp was prepared for to confirm that 2 ground threads and 1 thicker supplementary thread is wound at the same time. The warp is wound up, starting at one end. It is now taken to where weaving will happen. There are two styles of looms in Bhutan: the triangular back strap and the horizontal loom. At Leki Textiles here are many versions of the same frame for the back strap loom. The basic framework is a vertical frame which has two sides. The two sides must be sturdy as force will be exerted against it when tension is applied. The two sides has a series of holes that match. Here some looms have a braced frame (blue warp) while another utilises the framework of the building (white warp). The one in the front was 2 metres high with the holes about 15cm apart. The choice of holes and height of the frame will determine the length of warp that can be woven. We saw variations on this in other establishments. The warp is tensioned by body tension. One end of the warp is around two pipes attached to the frame (top and bottom). This allows for separation of the circle that is the warp. The third corner of the triangle is the ‘front beam’ which the warp goes around. This is attached to the body by the ‘back strap’. Tension is applied when the weaver braces her body against the loom and released when she relaxes. This ability to tighten and then relax is necessary to achieve good open sheds to put the shuttle through. The following sequence shows how the warp is anchored in the front ‘beam’ to stop it slipping. Note there are two halves to the front beam. At this point the warp is not anchored between them. Once the warp is organised to her satisfaction and weaving is ready to begin, the warp is sandwiched between the two halves. And tied together. The other end of the rope is attached to the strap that goes behind the weavers back. 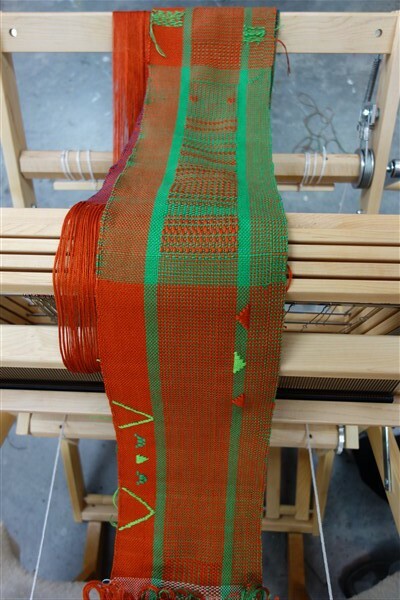 The width of the back strap loom is limited by the comfortable width for the weaver to work with. In this tent there is a loom. The height of this tent does not allow for a tall back strap loom of the type we have seen. An alternative way has to be improvised to weave a long length. Here is one end of the loom. At the far left the warp is tied to the framework of the tent. 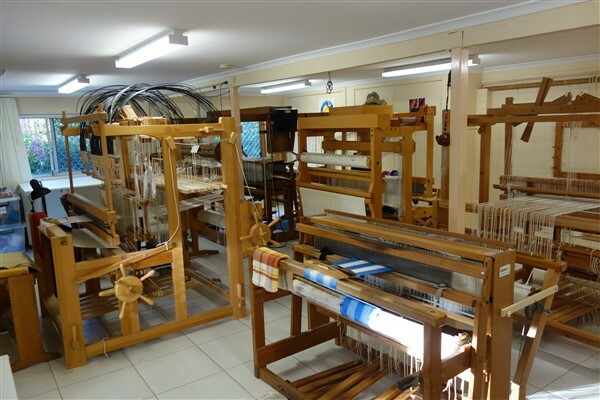 The height of the loom is achieved by 2 forked sticks which are the same height. At this end is the weaver. She braces her feet against a board attached to the forked sticks. The horizontal loom was introduced from Tibet sometime around 1920. Apparently the story is well known. A young man Sonam Dondhrup went to Tongsa Dzong, the home of the royal family at that time to seek his fortune in the king’s service. He became a skilled back strap weaver. Ashi Wangmo, the young daughter of the first king who was a nun noticed his skill and asked him to stay with her as an attendant. She had over 100 female weavers but no male ones. She knew that there was a different loom in Tibet and asked him to go and learn about them. He spent 9 months there but no one would teach him. Then Ashi Wangmo sent two sets of gift cloth to give the Tibetans and after that they taught him. 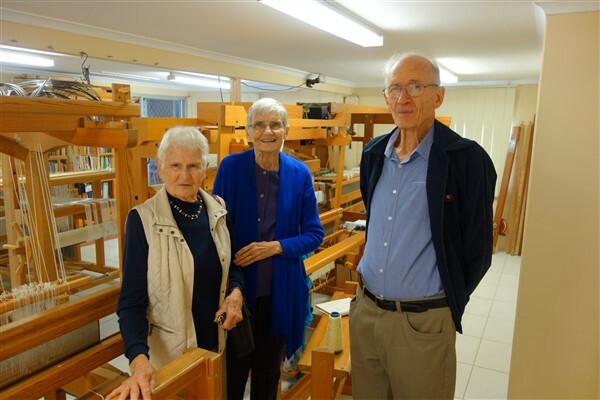 He came back and made a horizontal frame loom, and taught her how to weave on it. (excerpts from “the Land of the Thunder Dragon” see reference list on previous post. It was introduced into central Bhutan by the 1930s. The loom I measured was 94 cm wide, 104 cm long and 110 cm high including the castle (top part at the centre of the loom). There are 4 foot treadles which are often not anchored to the frame of the loom. These are tied directly to the 4 shafts. The shafts operate in a counterbalance method with shafts 1 and 2 being linked and 3 and 4. Note the rollers at the top of the loom that allow movement of connected shafts. There are two sets: one for shafts 1 and 2, the other for shafts 3 and 4. (I’m allocating shaft numbers by counting from the front.) When shaft 1 is pulled down, shaft 2 will go up and vice versa. At the same time when shaft 3 goes down, 4 will go up and again vice versa. It is important to note that the first two shafts ae not linked in any manner to the second two. This has repercussions for achieving weave structure. If the warp was threaded from shafts 1 though to 4, then plain weave could be achieved by depressing with two feet treadle 1 and 3 for one row and then treadle 2 and 4. This makes weaving the “everyday cloth” of the previous post very easy. The other point of interest is the breaking system. Notice the use of 2 metal spikes with a bent end. Holes in the front and back beam and nails or in this case pegs on the inside of the top of the loom is used in combination with the spike. The right combination will achieve a desirable weaving tension. The weaving sword is a solid piece of wood that has both a narrow and a wider edge. It is used to open a gap (weaving shed) through which the shuttle passes and beat the weft into place. Because of the tightness of the weave it needs to have reasonable weight to help pack in the weft thread. The shuttle is just a log stick that has the weft thread wound around it. Here the shuttle with green thread can be seen inside the weaving shed. In this weavers hand is a slim pointed stick used to pick up the design. It may be brass or made from bamboo. In following movies it will be seen to be used. A temple is used to keep the weaving width constant on a back strap loom. 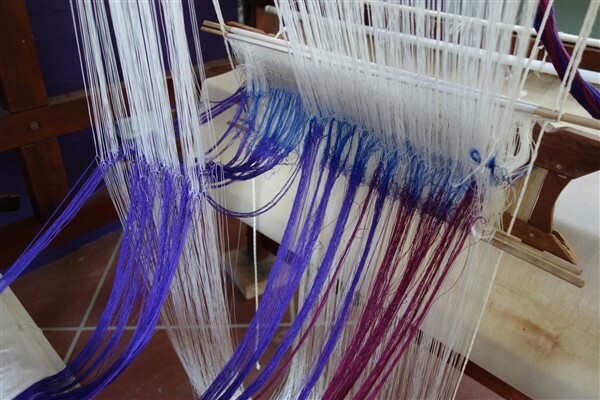 Unlike a western loom, there is no reed to keep the warp threads spaced. If a temple is not used, the weaving width will gradually decrease. Look for it under the cloth being woven near the edge of weaving. The temples used are bamboo cut to size with two points either end. These points leave quite large holes along the selvedge. Many Bhutanese textiles have this chain effect on the ends. It may be one or two colours. It may be a single row or several. It may be done on a back strap or horizontal loom. In this case it is done on an open shed. This means it will only be seen on this side of the fabric. It is easiest to work with 2 loops as that will ensure one loop passes through the other. Weaving with a back strap loom. All Bhutanese fabrics whether for plain weave, kushü, supplementary warp or supplementary wefts require the ability to weave plain weave. This image shows the two elements to achieve both lifts for plain weave. When the yellow heddles are relaxed, the warp threads that pass over the bamboo are raised, especially when tension is applied. When a weaving sword is inserted and turned on its side, a gap is achieved to allow the shuttle to pass through. 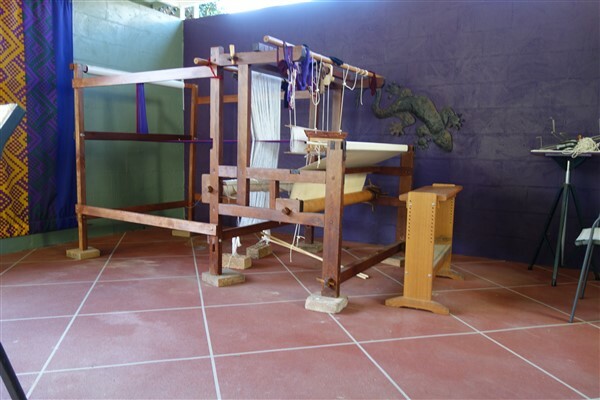 When the yellow threads are pulled up and to do this the warp tension is relaxed, the weaving sword can be inserted, turned on its side to allow the alternative shed for the shuttle to pass through. The weaving sword on its side. It is in this gap that the shuttle will pass. This movie shows a simple form of Kushü being woven. In this case after every row of supplementary weft, a plain weave row must be woven. There are several important things to note. The first is that the insertion of the supplementary weft is always done on an open shed. This means that the fabric is one sided with only the tails of the reads being seen on the reverse side as they are poked through to the back when finished being used. 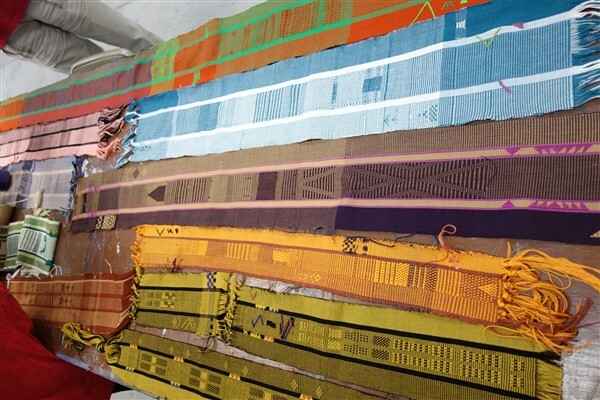 An examination of a kushü fabric will show that there are several styles of stitching. There are two classes of kushü stitches. Sapma includes the filling stitches: A and B in the above image. Thrima includes the wrapping or coiling stitches: C (diagonal), D (vertical), E (horizontal). In both A and B above, both have an outline and then the centre filled. The filling for A is achieved by picking up the motif and inlaying the thread, while B has a solid centre. Note on B that there appears to be crossed threads. This sample shows how to construct both the diagonal and how to create stitch B. This sample was woven on a loom that Wendy (our tour expert) had provided. While the yarn wasn’t great it allowed an understanding of process. This scale of thread also allows for the management of the warp threads to be seen. When weaving kushü 4 sticks are required to set up the loom. Two are for normal plain weave. Two extra sticks are used to raise all threads that will be used to work the kushü. A 6 warp sequence id required- 3 on one shed and 3 on the other. The threads for the kushü is picked up so that 2 threads are on the extra rod and then one dropped, for each extra rod. If you look closely at the above image you should be able to see this. The gap provides a space for the supplementary weft threads to turn and sit nicely (especially if there are 2 in the one turning point) and is a very useful tool for choosing placement of motif. 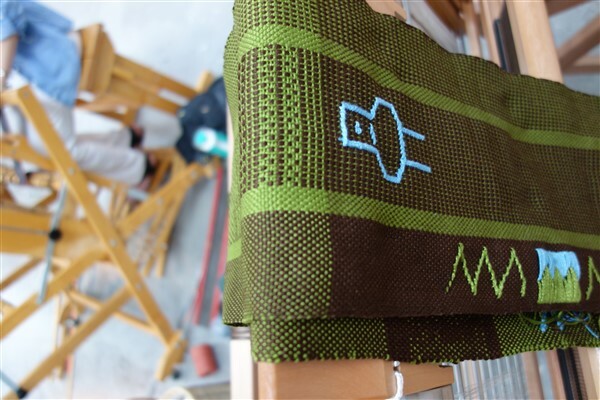 The sampa or filling stitches as well as the diagonal thrima are completed every row. The following movie shows how to complete a horizontal row. The vertical stitch is worked every 2 rows in the following manner. These are two samplers. One with the basic stitches and half a pattern that I worked on Wendy’s loom and the sample that we worked on at Leki Textiles. I can’t claim credit for the whole lot, only the very top end: that was half a day’s work. The rest was done by a weaver at Leki’s. We were fortunate that they did some patterns as this will give us reference for how the stitches are used. The most important thing to remember is to be aware of what will be the next pattern row and to get your threads into position. There are 4 sticks required for the supplementary: 2 for the ground or base fabric and 2 for the supplementary stripes. The weaver picks up alternate supplementary warp threads, constructs heddles for them and places them onto the extra rod. The process is repeated for the alternate supplementary warps. 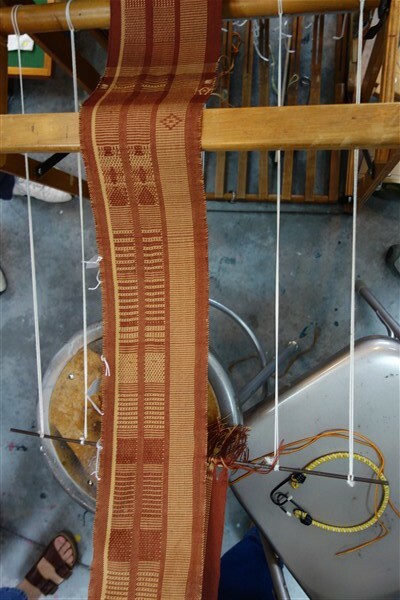 In this image from the bottom is the heddle rod for plain weave, then one of the pattern rods and then the alternate one. The rod she has in her hand is the one that will hold the pattern heddles. She will repeat it for the other pattern rod. To weave, the pattern row is lifted and included with 2 ground weave passes. This as it is shown will achieve a horizontal row of supplementary warp. If a more complex pattern is required, the pattern is picked up from this rod. Pick up supplementary pattern rod and select motif with the pick-up stick. In this case as the pattern is picked up, it is stored for temporary use on an extra rod. You will also notice that in the initial stripe, she corrects a mistake. An extra ground thread had been picked up. Then change the ground shaft and weave. Select the shaft that has the rod for the kushü. Bring back down the supplementary stored design. The stored pattern is used twice. Change the ground weave and beat. The following 2 movies show the sequence. My apologies for the background chatter. Most of it does not apply to this loom. This example shows the characteristics of yathra. It is a supplementary pattern on a twill ground. To weave a 4 end twill which is what this is, requires a 4 shaft loom. But the inherent qualities of the Tibetan horizontal loom having 2 separate rollers means that it cannot be threaded as we would on a western loom. A reminder: on a horizontal loom when shaft 1 goes up 2 goes down. Both cannot be up or down at the same time. The same applies to shafts 3 and 4. So for us in the West a normal till progression may be shafts 1 and 2 followed by 2 and3 and so on. This obviously will not work. So the Bhutanese have come up with an alternative threading system: shaft 1, 3, 2, 4 or it could equally be 1, 4, 2, 3. The important point is that the back and front alternate. That means a twill progression can now be achieved by shafts 1 and 4; 2 and 4; 2 and 3; 1 and 3. For those that are weavers the following draft will explain the theory. The supplementary weft needs to be added in. The supplementary thread is added in the same shaft as the ground. This is a two faced fabric. In other words pattern can be seen on both sides hence it is inserted in the same shaft. The same style of wrapping and twining as for the kushü may be used. The background row of weaving follows the pick-up row. The pattern row may be every row and this will achieve a diagonal line or it may be every 4th row for a vertical line. A single shaft will be used for a horizontal row. (see above blue textile). The pattern rows alternate in the following example. There is one remaining mystery: what causes the “breaks” in the vertical that you may have noticed in this and the above textiles. It appears that the diagonal line of the twill is interrupted. This effect can be seen very clearly in this fabric on the loom. From a weave structure aspect, it has no answer. But look to the reed for the answer. Four warp threads ie shafts 1,4,2,3 are all placed in the same dent. The spacers are very solid bamboo. These spacers are what is causing this pattern effect. By the way the new yathra textiles are sold unwashed. These gaps may close up with wet finishing. But in Bhutan, how often does that happen? The trip is over, analysed and recorded. The memories are fresh. It was an amazing trip. I have collected new textiles for my collection and for sharing with others. My current textile wall. They are all there (nearly). There are 2 from Laos and 7 from Bhutan in all different techniques. I do like the fact that two of those are ‘foreigners’. It is however what follows now that I am looking forward to. 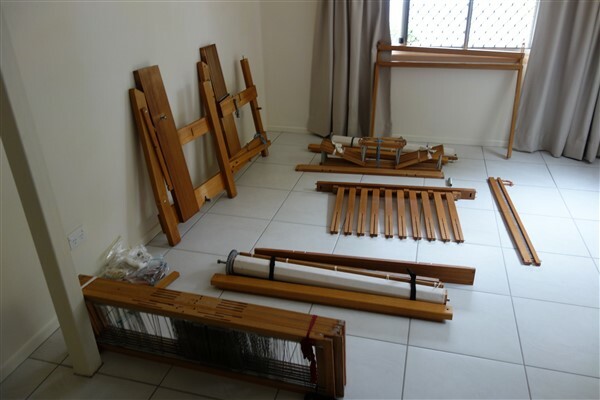 I did bring home a full back strap loom that I had set up in in Khoma with a supplementary warp as well as other loom bits. I will look forward to playing. A textile tour to Laos and Bhutan Part 1. This trip started with a Laos extension with 2 friends (Bettes Silver-Schack and Deb McClintock) before we joined the tour to Bhutan. The main purpose of this part of the trip was to attend the Paeng Mai Weaving School. This was just too good an opportunity not to value add. 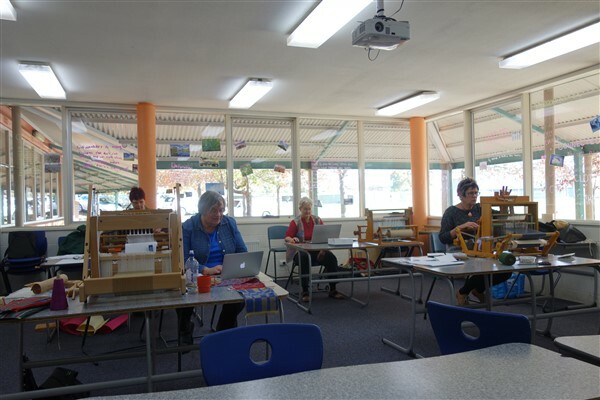 Deb had attended the school several times prior to this trip and was keen to re-attend, so we organised a 4 day class where we each chose a specific topic. Of course while we were in Vientiane we also added in a much textile related activities as we could. Any basic loom information can be found on my previous trip to Laos/Thailand. The looms are similar. Here, I will be focussing on specifics related to the topics covered in the course. I chose to work on the supplementary warp technique (Muk). This is the traditional cloth from which I took my inspiration. I selected 2 of the supplementary warp motifs. As well as supplementary warp, it has weft ikat and brocade (discontinuous weft). The basic loom was set up before I arrived though it was decided to move it as the light wasn’t great. 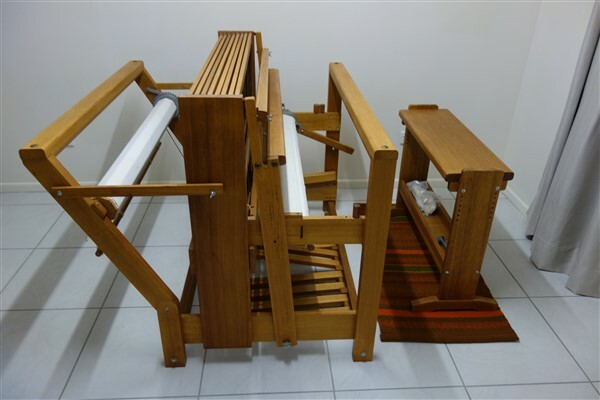 One of the advantages of this style of loom is that it can be easily dismantled and reassembled. Before adding in the extra warp, weaving of the ground begins. About 1 cm is woven. This provides a means of anchoring the supplementary warp later on. The supplementary warp was wound. This is an extremely large warping board capable of winding a 60 metre warp. The principle of using a threading cross (bottom centre) is the same. The supplementary warp is chained and taken to the loom. Note the supplementary warp( white) is kept separate from the ground warp (black). It follows a different path and is tensioned separately. The angle of the supplementary warp under the ground warp is quite exaggerated. When required it is raised above the ground warp. When not required it will stay well out of the way. 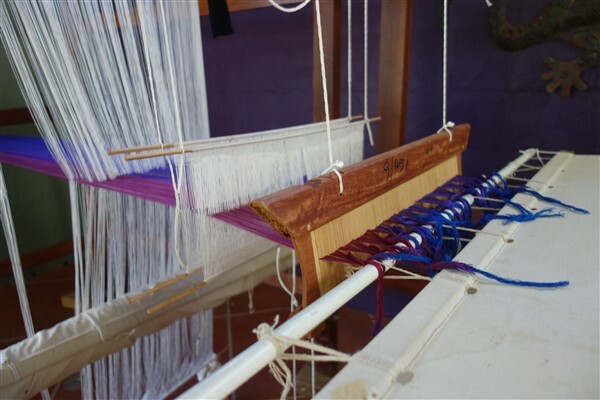 The warp is positioned on the loom frame before combining with the ground warp. Once positioned, the supplementary warp is placed in its correct position in the ground warp. Each supplementary warp is passed through the vertical storage system, between the ground weave shafts and through the appropriate dent in the reed. The ground and supplementary warp alternate. The ground sett remains the same. The supplementary warp is then secured on a stick at the front. When required according to the design, the shafts are picked up and raised. This “S” shaped hook secures the selected threads while 2 ground rows are woven. In this case 5 shafts were required and are on the hook. It varies every 2 rows according to the drafted design. That “s” hook is suspended by a series of rubber bands to give stretch to allow movement of the shafts on and off the hook. Weaving progresses. Note: The single supplementary warp threads alternating with a single ground thread. (The weaver would be at the top of the image). Close up showing some supplementary warps picked up and left unused. There is no danger of the warp being accidentally caught. The warp is weighted to ensure it stays down. 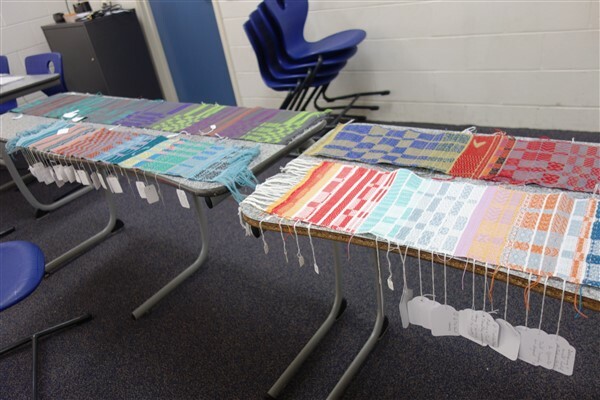 I’ve finished weaving…. well me and my loom buddy, Tan, have finished. Whenever I got up she would keep weaving and she was at it before I got to the studio and after I left. I did weave at least half. At least it got finished just before time was up on the last day. Meanwhile Bettes has worked on a brocade technique (Chok) using a vertical storage system. Deb had decided that she wanted to master a lace weave technique that she had seen on a traditional cloth. The loom was set up to aid the picking up of the leno groups but it is all finger manipulated. It originally was a Tai Lue technique. Deb has mastered ‘Pineapple” leno. The finished scarves. From LHS Bettes, mine and Deb’s scarves. The following are a couple of interesting tips. Until now I had used a knot above the head of the weaver to tension the warp. It must be undone and then reformed. 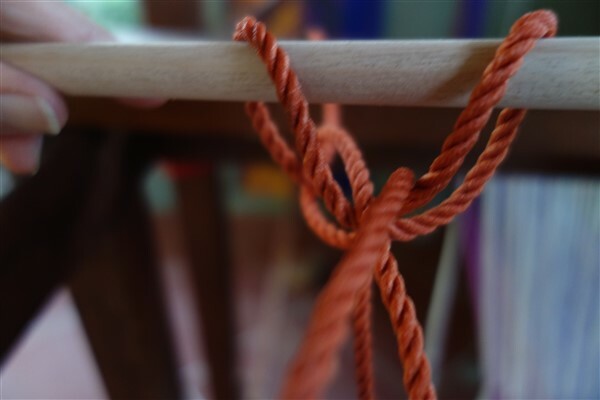 However this modification means that the knot does not have to be shifted. The rope allows for the warp to be released, advanced and then retightened. The following are a couple of interesting places to visit. This is a privately owned museum which had a display of looms, traditional textiles and a shop with the focus on silk. I noted a couple of loom modifications. There was also an amazing collection of textiles. On one of the looms that was set up, we noticed the bottom bar is extended. This is an alternative device that separates the supplementary warp from the ground warp. 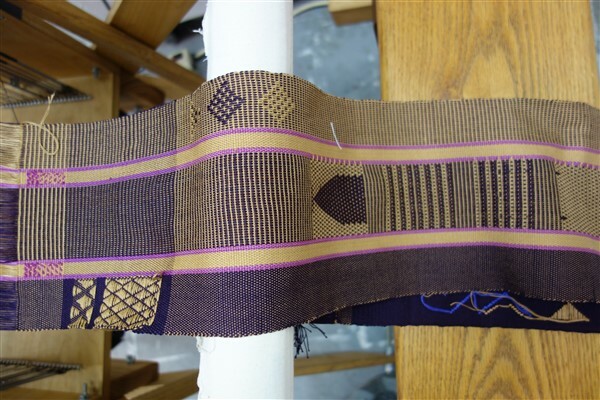 This is an example of the supplementary warp fabric woven on this loom. Carol Cassidy www.laotextiles.com A well known and long time USA entrepreneur/weaver, living in Vientiane who works with local weavers selling through her workshop/gallery. Taykeo Textiles Gallery An amazing collection of historical textiles as well as modern traditionally based ones. Taykeo Sayavongkhamdy is owner. Detail of one of the silk supplementary weft brocade cloths based in a traditional design. A free day in Bangkok while we waited to join the tour to Bhutan, meant that there was an opportunity to visit The Queen Sirikit Museum of Textiles. Deb had organised a private tour with a curator. Unfortunately there’s no photography allowed of the exhibitions but at the end of the tour we came across this weaver and some interactive displays. This is an amazingly complex fabric. And she managed to keep track of what was going where while talking to us. Over the next few days I hope to post the second instalment of my last adventure where I go to Bhutan- where there are the most amazing living textiles. 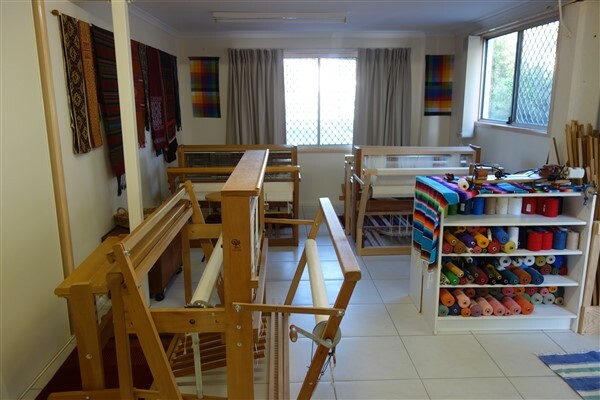 The primary focus this month has been getting ready for the opening of my weaving school. 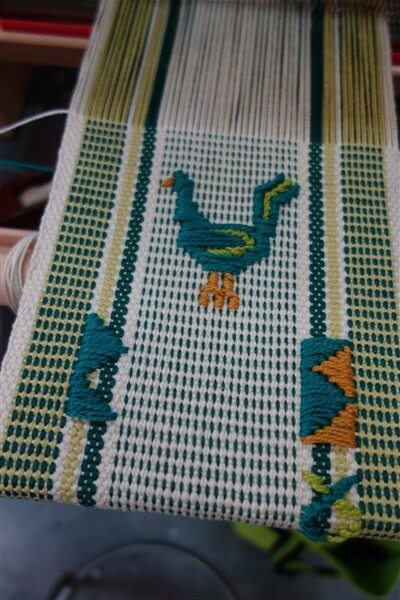 Occasionally I have taken time out to work some more on the Laos loom project. Firstly the school. The space comprises of two rooms. One was full to overcrowding with looms. I am not sharing that mess. This other space had been occupied by my friend Marilyn who looked after my place while I was away. It is now empty. I get to take from the other space and rearrange here. The first loom is up. It’s the one that I collected from Maureen not so long ago. Each loom has it’s own floor rug. It’s a great excuse to weave some rugs. As they are not huge, it’s a quick and interesting project.. This room is now ready. And so is the other one. I am so pleased to now have space! 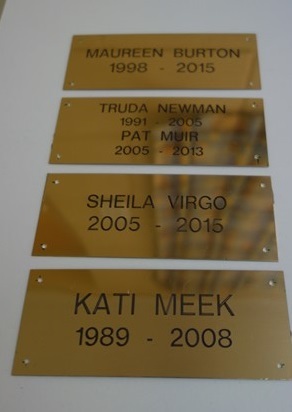 I’ve had brass plates made to celebrate my ‘friends’ and their looms. Kati’s loom will always be Katie’s loom (the draw loom) as will all the rest. All I have to do is attach them. And friends have come and visited. Pat was one of my very early weaving friends. Marg and Mike used to own a ‘friend’ in my studio. In fact Mike made it; a 16 shaft computer assist countermarche beauty. 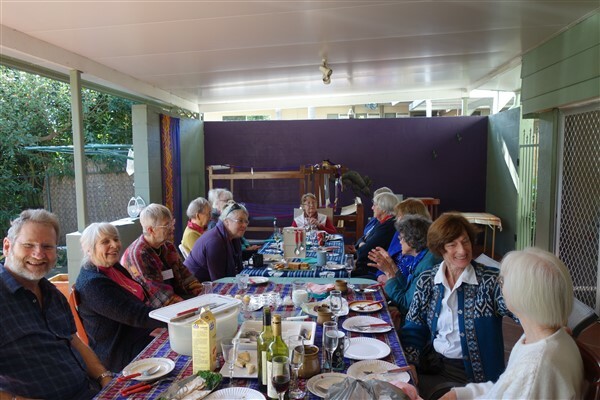 And the Weavers Interest Group came from Qld Spinners Weavers and Fibre Artists. I can hardly wait till my first week’s class. I haven’t had a great deal of time to work on the Laos loom project. At the end of last month, I had knotted the new warp onto the dummy warp. Now to get it on the loom. Step 1: Sort out what goes where. Suspend the beater and shafts. Another view. I’ve used a set of pulleys on the plain weave shafts. When one shaft goes down, the other will go up. Note at this stage there has been no effort to get either the beater or plain weave or pattern shafts at the correct level. Step 2: pull the knotted warp through firstly the vertical storage pattern heddles and then the plain weave heddles. Now it is very easy to see how the heddles are made: two interlocking loops with the warp thread passing through the junction. Step 3: Pull the knotted warp through the reed/beater. Then tie the warp onto the front bar of the cloth storage beam. Step 4: Level the heddles and beater making sure the warp threads are centred. The warp needs to be under tension. I have it secured with the ikat clamp I used previously when knotting the two warps together. Step 5. Now to attach the treadles. 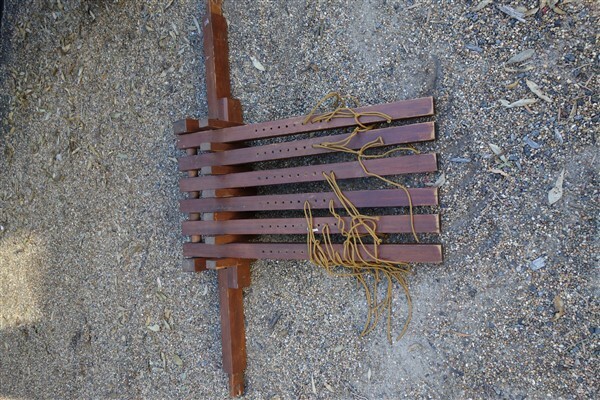 These are the original treadles. They would be way too heavy for this project. I’ve attached two lengths of pine. They are not anchored at the front in the style of what I saw in Laos. They are attached to the bottom of the plain weave shafts. I’ve centred them on the shafts so that they will pull evenly down. This has resulted in the treadles being very close together. I may make both slightly off centre: one to the right, the other to the left to give some foot space. Notice the loom is on blocks. We’ve had rain and a bit of water came through here. I’ll take it off the blocks when I come to weave. 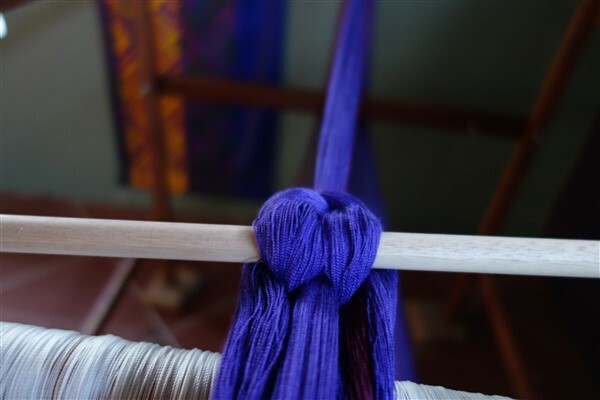 When it is time to advance the warp, the weaver undoes the knot, winds the warp on and then re-tensions with this knot. Here’s an image of it loosely formed. And of the real thing. And it works! The warp is under beautiful tension. Next month maybe I’ll get to weave. My aim is to do plain weave first and just get a feel for weaving on this loom. You’ll notice that the vertical storage system is set well back and will not play a part. Unfortunately, I wasn’t home with enough time to continue the exploration of looms from Laos. It will have to wait till another time. This month was a month for teaching away from the studio. 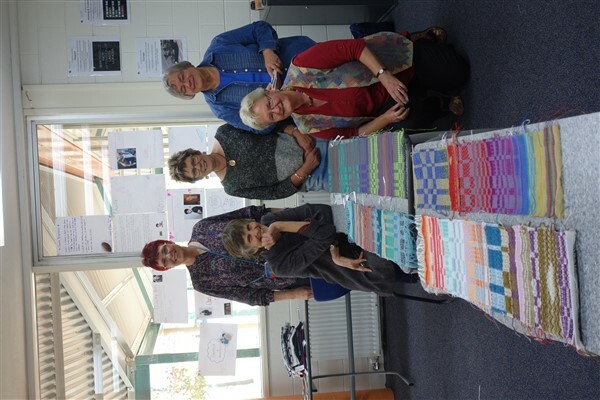 Firstly there was Fibres Ballarat organised by Glenys Mann. The class was titled Ties: Decorative, Functional and Unconventional. There were four in the class. They worked extremely hard experimenting with the many aspects covered and ended up with a collection of well documented samples and designs. For those who chose to, there was also the opportunity to start a project on the end of their warp. The following are some images from the class. It was a great space with plenty of natural light and lots of space. The samples with tags. There’s lots of information here. The following images show more detail of samples. The class of 2015: Wendy, Jeanette, Di and Denise. Five days and several late nights resulted in great results. Each day there were additions of wonderful installations. 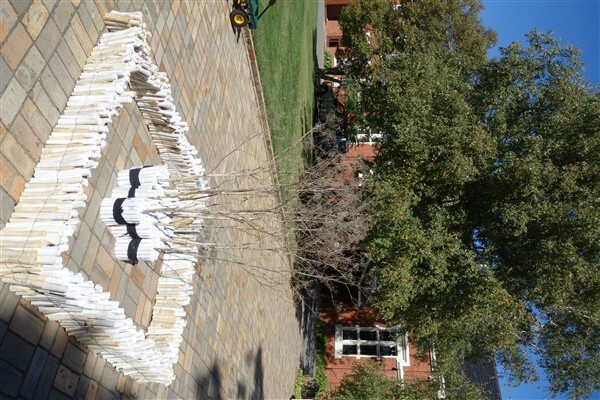 I was particularly taken with a grouping of altered books suspended in a tree. Deb McArdle was the artist responsible. And another of her installations. It was a delightful destination. Around the garden some interesting sculptures could be found. The title of the course was East Meets West where students explored traditional backstrap techniques interpreted into shaft weaving. As there were twelve in the course, there was a great variety of work produced. The following shows some of the student’s work. At the end of three days, this was the result. Somehow, I am missing three students work above. My apologies to those whose work is missing. I am very proud of what all achieved. Each day I walked under these. It was only on the final day it registered how clever these were: a very appropriate entrance to the painting studios. Then it was off to visit my friend Judith. 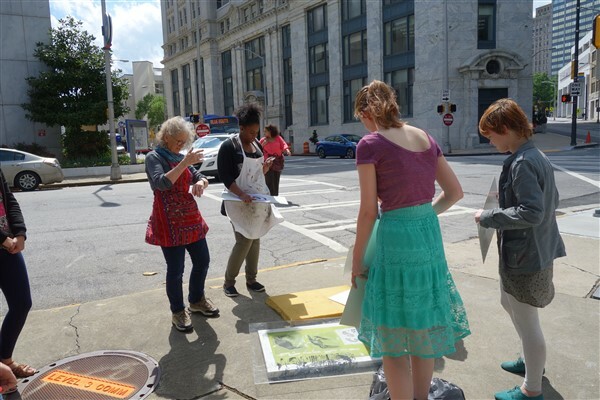 She’s currently studying printmaking at Georgia State, Atlanta. I was fortunate to be asked along as a visitor. I wonder what the motorists thought of this. Here we are on a traffic island with the traffic whizzing around while the sun worked to develop a solar screen. This is was the most convenient location where good sunlight was possible. When we get together, we usually have a play with some sort of technique. 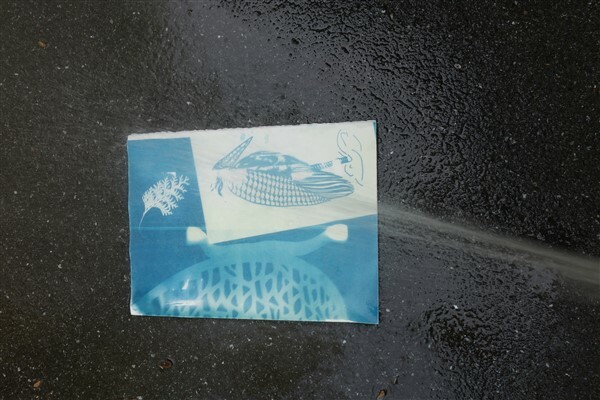 This time we took the opportunity to work with cyanotype. It was used in the creation of blueprints. Chemicals are mixed and applied, in this instance to paper. The moment it is exposed to light the chemicals start working. 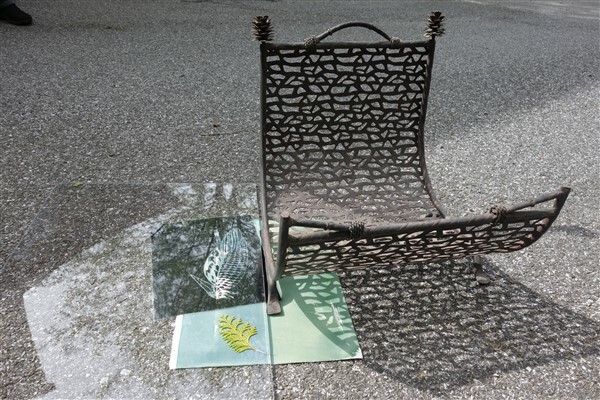 In the following cases we explored using stencils, plants and shadows. Once the sun has activated the imagery (time is critical), the paper is washed. The imagery turns blue; a process in some ways very reminiscent of indigo. The following shows the process. 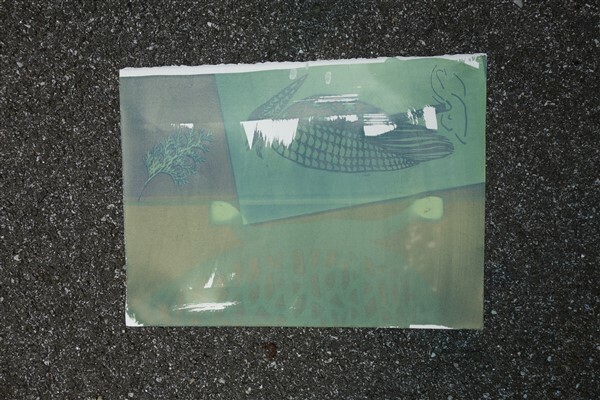 The treated paper with images is exposed to sunlight. The places where the sun can’t reach will stay white. We hope enough time has elapsed. We timed it for 15 minutes. This is how the paper appears before washing. After washing off the chemicals. The paper was hosed. The images turn blue and it’s quite like magic. At some stage I’d like to return to this process and explore applications on textiles. It has potential. Next month will have a focus on exhibitions. While I was in the USA, I was approached by Gatakers Artspace to hold an exhibition. The exhibition, Interlacement, opens in Maryborough next Friday and will be open for May. The following month, Pattern: A Universal Phenomenon will be hosted by Emerald Regional Art Gallery. 5th June – 17 July. Plans continue for the opening of my school. Check out the details on either this blog or my website. You are currently browsing the archives for the looms and weaving establishments category.